We decided to take it easy yesterday and ride in the evening up Provo Canyon. We started at the mouth of Provo Canyon, went up the parkway to Bridal Vail Falls and then south on the Bonneville Shoreline. It was a nice change of pace. It has been a few months since I did this ride and I was amazed at how easy it seemed compared to before. Of course last time we did this the biggest challenge was the snow on the trail. But still the hardest hill on the ride was relatively easy. I think the rides up Slate Canyon are paying off. 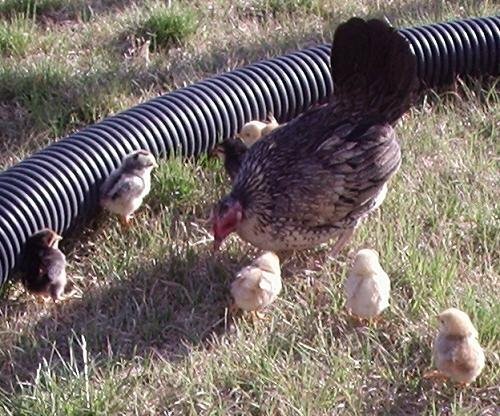 I didn't take the camera with me yesterday so today's picture is of a Chicken and her babies. Thought: This hen hatched 7 babies and I hatched 4 in an incubator. After a week or so I decided I would try and give the babies I had hatched to the mom and see if she would take care of them. I took them out an put them with the mom as she was out feeding the babies. After a while the mom decided it was time to move to cover for protection and warmth. The babies she hatched followed her but the babies I hatched just stood there chirping their hearts out because they were cold and didn't know to follow. So I went to the babies to pick them up and the mom came back to get them. She tried to get the chicks to follow but they wouldn't. Eventually she had to leave them where they would be eaten by a cat because she could not let the chicks that would follow be endangered by those that would not. I thought this was much like Christ, He is there for us, He wants us to follow him, He will protect us, we just need to be willing to follow him.